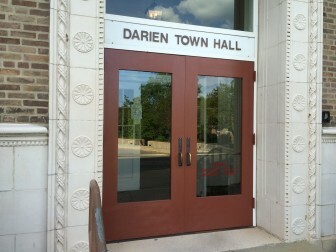 The town government will be rebuilding the front entrance to the Town of Darien Town Hall. 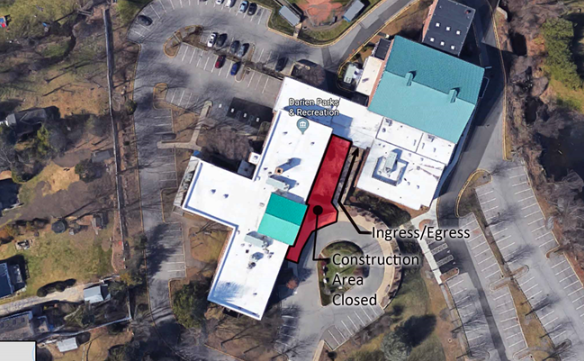 When construction is done, the entrance will have both interior and exterior handicap accessible ramps. The front entrance will be out of service throughout construction period. Alternate access to and from the Town Hall will be through the side door (near the gymnasium). Once inside of the building, all offices will remain accessible. Construction signs directing employees and our customers will be in place. Doors to the rear of the Town Hall will remain in use for ingress and egress. The front entrance will be out of service from Thursday, Aug. 23, 2018 and reopened on Monday Sept. 17, 2018 weather permitting. If this schedule changes for any reason, another news release will be issued. The Town Hall building, as seen from above. The construction area for entrance in the front is in red. The mailbox in front of Town Hall will remain accessible. Access from rear under breezeway to front of Town Hall will not be accessible. We regret this unavoidable inconvenience. Please plan accordingly. The photo above shows exterior area that will be in accessible and alternate entrance and exit.